Intro Kit w/ Coated Bands (Includes: (2) ContactPro Rings, (10) Coated Matrix Bands of Each Size: 3.5mm, 4.5mm, and 5.5mm, (10) Wood Wedges of Each Size: X-Small, Medium, and Large, (1) Ring Forcep) The new ContactPro® Sectional Matrix System provides a solution for Class II Restorations. The ContactPro® Ring provides consistent clamping force throughout the lifecycle of the product which helps achieve minimal flash and great contact! This ring was designed to allow for great visibility in your working area and better access for light curing. 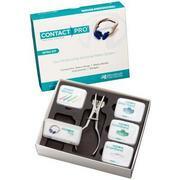 Pair the ContactPro® Ring with the coated or uncoated ContactPro® Smartbands for a snug fit at the gingival margin, the ContactPro® Wedge, and DryTips® for advanced moisture control for a successful Class II Restoration.